Cities: Capital — Singapore (country is a city-state). 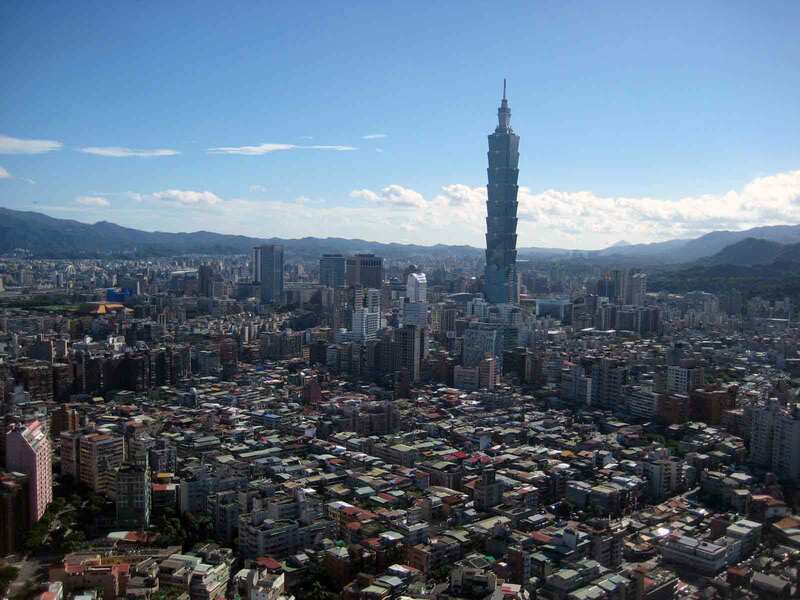 Population (June 2011): 5.184 million (including permanent residents, foreign workers). Annual population growth rate (2011): 2.1% (total); 0.5% (Singapore citizens and permanent residents). Ethnic groups (June 2011): Chinese 74.1%, Malays 13.4%, Indians 9.2%, others 3.3%. Religions: Buddhist, Taoist, Muslim, Christian, Hindu. Languages: English, Mandarin and other Chinese dialects, Malay, Tamil. Education: Years compulsory: 6. Literacy (2010) — 95.9%. Health: Infant mortality rate (2010): 2.0/1,000. Life expectancy (2010) — 79.3 years male, 84.1 years female. Work force (Dec. 2010; 3.1059 million): Manufacturing — 17.3%; services — 69.3%; construction — 12.7%. Constitution: June 3, 1959 (amended 1965 and 1991). Branches: Executive: president (chief of state, 6-year term); prime minister (head of government). Legislative — unicameral Parliament. Judicial — High Court, Court of Appeal, subordinate courts. Political parties: People's Action Party (PAP), Workers' Party (WP), Singapore People's Party (SPP), Singapore Democratic Party (SDP), Singapore Democratic Alliance (SDA), National Solidarity Party (NSP), Reform Party (RP). Suffrage: Universal and compulsory at 21. Central government budget (FY 2011): Total expenditures U.S. $37.09 billion (47.10 billion Singapore dollars, at a 1.27 exchange rate). Defense (FY 2011): 4.0% of gross domestic product. GDP (2010 nominal prices): $222.7 billion. Annual real growth rate: 8.8% (2007), 1.5% (2008), -0.8% (2009), 14.5% (2010). Per capita GDP (2010): $43,867. Agriculture (under 0.5% of GDP): Products — poultry, orchids, vegetables, fruits, ornamental fish. Manufacturing (22.2% of real GDP): Types — electronic and electrical products and components, petroleum products, machinery and metal products, chemical and pharmaceutical products, transport equipment (mainly aircraft repairs/maintenance, shipbuilding/repair and oil rigs), food and beverages, printing and publishing, optical and photographic equipment, plastic products/modules, instrumentation equipment. Trade (2010): Exports: $351.18 billion: petroleum products, food/beverages, chemicals, pharmaceuticals, industrial machinery and equipment, electronic components, telecommunication apparatus, transport equipment. Major markets — Malaysia (11.9%), Indonesia (9.4%), Hong Kong (11.7%), EU (9.8%), China (10.3%), United States (6.4%), and Japan (4.7%). Imports — $310.39 billion: aircraft, crude oil and petroleum products, electronic components, radio and television receivers/parts, motor vehicles, chemicals, food/beverages, iron/steel, electricity generators. Major suppliers — EU (12.3%), Malaysia (11.7%), United States (11.2%), China (10.8%), and Japan (7.9%). The government has mandated that English be the primary language used at all levels of the school systems, and it aims to provide at least 10 years of education for every child. In 2010, primary and secondary school students totaled about 478,294, or 9.4% of the entire population. In 2010, enrollment at public universities was 74,534 (full-time/part-time) and 83,542 at the polytechnics. The Institute of Technical Education for basic technical and commerce skills has 24,789 students. The country's literacy rate is 95.9%. Singapore generally allows religious freedom, although religious groups are subject to government scrutiny, and some religious sects are restricted or banned. Almost all Malays are Muslim; other Singaporeans are Taoists, Buddhists, Confucianists, Christians, Hindus, or Sikhs. Although Singapore's history dates from the 11th century, the island was little known to the West until the 19th century, when in 1819, Sir Thomas Stamford Raffles arrived as an agent of the British East India Company. 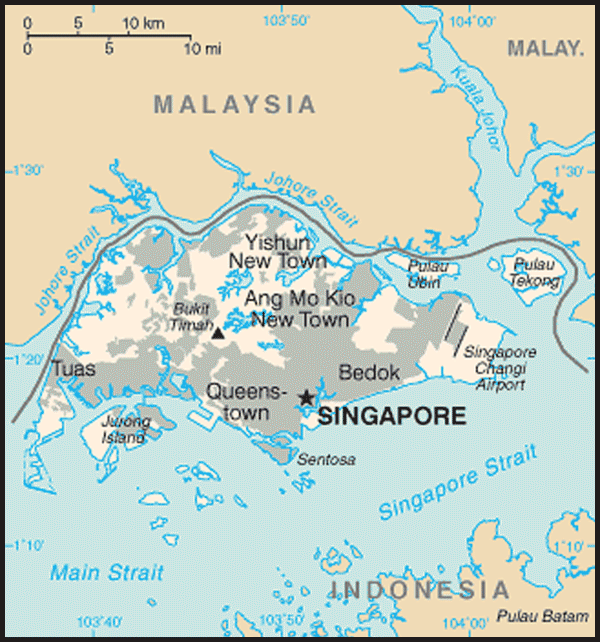 In 1824, the British purchased Singapore Island, and by 1825, the city of Singapore had become a major port, with trade exceeding that of Malaya's Malacca and Penang combined. In 1826, Singapore, Penang, and Malacca were combined as the Straits Settlements to form an outlying residency of the British East India Company; in 1867, the Straits Settlements were made a British Crown Colony, an arrangement that continued until 1946. The opening of the Suez Canal in 1869 and the advent of steamships launched an era of prosperity for Singapore as transit trade expanded throughout Southeast Asia. In the 20th century, the automobile industry's demand for rubber from Southeast Asia and the packaging industry's need for tin helped make Singapore one of the world's major ports. In 1921, the British constructed a naval base, which was soon supplemented by an air base. But the Japanese captured the island in February 1942, and it remained under their control until September 1945, when the British returned. In 1946, the Straits Settlements was dissolved; Penang and Malacca became part of the Malayan Union, and Singapore became a separate British Crown Colony. In 1959, Singapore became self-governing, and, in 1963, it joined the newly independent Federation of Malaya, Sabah, and Sarawak — the latter two former British Borneo territories — to form Malaysia. Indonesia adopted a policy of "confrontation" against the new federation, charging that it was a "British colonial creation," and severed trade with Malaysia. The move particularly affected Singapore, since Indonesia had been the island's second-largest trading partner. The political dispute was resolved in 1966, and Indonesia resumed trade with Singapore. 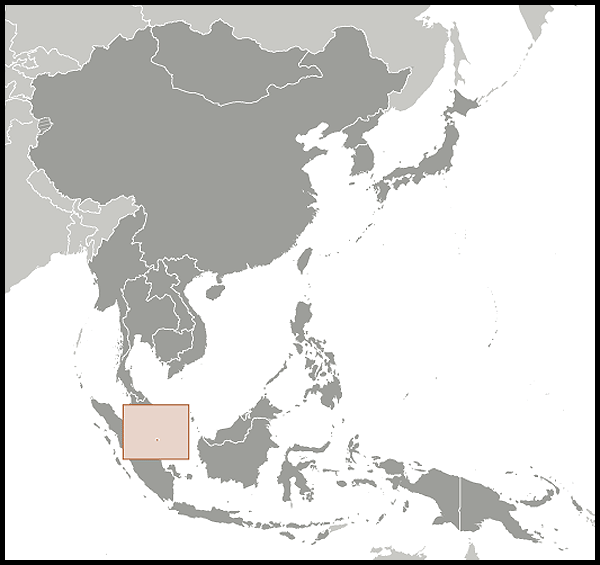 After a period of friction between Singapore and the central government in Kuala Lumpur, Singapore separated from Malaysia on August 9, 1965, and became an independent republic. According to the constitution, as amended in 1965, Singapore is a republic with a parliamentary system of government. Political authority rests with the prime minister and the cabinet. The prime minister is the leader of the political party or coalition of parties having the majority of seats in Parliament. The president, who is chief of state, previously exercised only ceremonial duties. As a result of 1991 constitutional changes, the president is now supposed to be elected and exercises expanded powers over legislative appointments, government budgetary affairs, and internal security matters. The last presidential election was in August 2011. The unicameral Parliament consists of 87 members elected on the basis of universal adult suffrage, and up to nine "nominated" members of Parliament (NMPs). In addition, a constitutional provision assures at least nine opposition members in Parliament, even if fewer than nine actually are elected; these are known as non-constituency members of Parliament (NCMPs). The president appoints nominated members of Parliament from among nominations by a special selection committee. Nominated members of Parliament enjoy the same privileges as members of Parliament but cannot vote on constitutional matters or expenditures of funds. The maximum term of Parliament is 5 years. NMPs serve for 2½-year terms. In the May 7, 2011 general election, the governing People's Action Party (PAP) won 81 of the 87 elective seats of the 12th Parliament. The opposition Workers' Party won the remaining six seats. There are three NCMPs in the 12th Parliament, two from the Workers' Party and one from the Singapore People's Party. Voting has been compulsory since 1959. Judicial power is vested in the High Court and the Court of Appeal. The High Court exercises original criminal and civil jurisdiction in serious cases as well as appellate jurisdiction from subordinate courts. Its chief justice, senior judge, and 12 judges are appointed by the president. Appeals from the High Court are heard by the Court of Appeal. The right of appeal to the Privy Council in London was abolished effective April 1994. Singapore maintains an embassy (http://www.mfa.gov.sg/washington/) in the United States at 3501 International Place NW, Washington, DC 20008 (tel. 202/537-3100, fax 202/537-0876). The ruling political party in Singapore, reelected continuously since 1959, is the People's Action Party (PAP), headed by Prime Minister Lee Hsien Loong. The PAP has held the overwhelming majority of seats in Parliament since 1966, when the opposition Barisan Sosialis Party (Socialist Front), a left-wing group that split off from the PAP in 1961, resigned from Parliament, leaving the PAP as the sole representative party. In the general elections of 1968, 1972, 1976, and 1980, the PAP won all of the seats in an expanding Parliament. Then-Workers' Party Secretary General J.B. Jeyaretnam (who died in 2008) became the first opposition party member of Parliament in 15 years when he won a 1981 by-election. Opposition parties gained small numbers of seats in the general elections of 1984 (2 out of 79), 1988 (1 of 81), 1991 (4 of 81), 1997 (2 of 83), 2001 (2 of 84), 2006 (2 of 84), and 2011 (6 of 87). Meanwhile, the PAP's share of the popular vote in contested seats decreased from 75% in 2001 to 60.1% in 2011. In the 2011 election, opposition parties together contested 82 of the 87 seats, the largest number ever. Singapore's strategic location on major sea lanes and its industrious population have given the country an economic importance in Southeast Asia disproportionate to its small size. Upon independence in 1965, Singapore was faced with a lack of physical resources and a small domestic market. In response, the Singapore Government adopted a pro-business, pro-foreign investment, export-oriented economic policy framework, combined with state-directed investments in strategic government-owned corporations. Singapore's economic strategy proved a success, producing real growth that averaged 8.0% from 1965 to 2010. The worldwide electronics slump in 2001 and the outbreak of severe acute respiratory syndrome (SARS) in 2003 dealt blows to the economy, but growth bounced back each time, driven by world demand for electronics, pharmaceuticals, other manufactured goods, and financial services, particularly in the economies of its major trading partners — the United States, the European Union, Japan, and China, as well as expanding emerging markets such as India. The global financial crisis of 2008 and 2009 had a sharp impact on Singapore's open, trade-oriented economy. Singapore saw its worst two quarters of contraction in late 2008 and early 2009, but quickly recovered with strong performance in later quarters. The Singapore economy grew a staggering 14.5% in 2010, the second-highest rate in the world that year. Singapore's largely corruption-free government, skilled work force, and advanced and efficient infrastructure have attracted investments from more than 7,000 multinational corporations from the United States, Japan, and Europe. Also present are 1,500 companies from China and another 1,500 from India. Foreign firms are found in almost all sectors of the economy. Multinational corporations account for more than two-thirds of manufacturing output and direct export sales, although certain services sectors remain dominated by government-linked companies. Manufacturing (including construction) and services are the twin engines of the Singapore economy and accounted for 26.7% and 67.5%, respectively, of Singapore's gross domestic product in 2010. The electronics and biomedical manufacturing industries lead Singapore's manufacturing sector, accounting for 31.4% and 19.6%, respectively, of Singapore's manufacturing output in 2010. To inject new life to the tourism sector, the government in April 2005 approved the development of two casinos that resulted in investments of more than U.S. $5 billion. Las Vegas Sands' Marina Bay Sands Resort and Genting International's Resort World Sentosa opened their doors in early 2010. To maintain its competitive position despite rising wages, the government seeks to promote higher value-added activities in the manufacturing and services sectors. It also has opened, or is in the process of opening, the financial services, telecommunications, and power generation and retailing sectors to foreign service-providers and greater competition. The government also has pursued cost-cutting measures, including tax cuts and wage and rent reductions, to lower the cost of doing business in Singapore. The government is actively negotiating eight free trade agreements (FTAs) with emerging economic partners and has already concluded 18 FTAs with many of its key trade partners, including one with the United States that came into force January 1, 2004. As a member of the Association of Southeast Asian Nations (ASEAN), Singapore is part of the ASEAN Free Trade Area (AFTA), and is signatory to ASEAN FTAs with China, Korea, Japan, India, and a joint agreement with New Zealand and Australia. Singapore is also a party to the Transpacific Strategic Economic Partnership Agreement, which includes Brunei, Chile, and New Zealand. Singapore's total trade in 2010 amounted to $661.58 billion, up 20.7% from 2009. In 2010, Singapore's imports totaled $310.39 billion, and exports totaled $351.18 billion. Malaysia was Singapore's main import source country, as well as its largest export market, absorbing 11.9% of Singapore's exports, followed by Hong Kong (11.7%). Other major export markets include the United States (6.4%), China (10.3%), and Indonesia (9.4%). Singapore was the 13th-largest trading partner of the United States in 2010. Re-exports accounted for 48.1% of Singapore's total sales to other countries in 2010. Singapore's principal exports are petroleum products, food and beverages, chemicals, pharmaceuticals, electronic components, telecommunication apparatus, and transport equipment. Singapore's main imports are aircraft, crude oil and petroleum products, electronic components, consumer electronics, industrial machinery and equipment, motor vehicles, chemicals, food and beverages, electricity generators, and iron and steel. Singapore continues to attract investment funds on a large scale despite its relatively high-cost operating environment. The United States leads in foreign investment, accounting for 15.2% of new actual investment in the manufacturing sector in 2010. As of 2010, the stock of investment by U.S. companies in the manufacturing and services sectors in Singapore reached about $106.04 billion (total assets). The bulk of U.S. investment is in electronics manufacturing and the finance and insurance industries. Non-bank holding companies accounted for 59.2% of total investment. About 2,000 U.S. firms operate in Singapore. The government also has encouraged firms to invest outside Singapore, with the country's total direct investments abroad reaching $247.06 billion by the end of 2009. China was the top destination, accounting for 17.1% of total overseas investments, followed by the United Kingdom (12.3%), Malaysia (8.4%), Hong Kong (6.3%), Thailand (5.7%), Indonesia (7.7%), Australia (6.8%), and the United States (3.5%). As of December 2010, Singapore had a total labor force of about 3.1 million. The National Trades Union Congress (NTUC), the sole trade union federation, comprises almost 99% of total organized labor. Extensive legislation covers general labor and trade union matters. The Industrial Arbitration Court handles labor-management disputes that cannot be resolved informally through the Ministry of Labor. The Singapore Government has stressed the importance of cooperation between unions, management, and government ("tripartism"), as well as the early resolution of disputes. There have been no strikes since 1986. Singapore has enjoyed virtually full employment for long periods of time. In tandem with the global economic crisis and the economy's contraction, resident unemployment reached as high as 4.9%. However, the overall and resident unemployment rates dipped to 2.0% and 2.9%, respectively, by the end of September 2011 due to the Singapore Government's job-saving measures and a gradually improving global economy. Some of Singapore's unemployment is attributable to structural changes in the economy, as low-skill manufacturing operations have moved overseas. Since 1990, the number of foreign workers in Singapore has increased rapidly, helping meet some labor shortages. Foreign workers comprise 35.8% of the labor force; the great majority of these are unskilled workers. Situated at the crossroads of international shipping and air routes, Singapore is a center for transportation and communication in Southeast Asia. Singapore's Changi International Airport is a regional aviation hub served by 80 airlines. A third terminal opened in January 2008, and a dedicated low-cost terminal for budget airlines has operated since 2006. The Port of Singapore is the world's second-busiest for containerized transshipment traffic after Shanghai. The country also is linked by road and rail to Malaysia and Thailand. Telecommunications and Internet facilities are state-of-the-art, providing high-quality communications with the rest of the world. Singapore is rolling out a nationwide broadband network that promises high-speed Internet connections at lower prices. Sixty percent of the country was covered as of the end of 2010. Eighty-one percent of the country's inhabitants have household Internet access. Government-linked companies and organizations operate all domestic broadcast television channels and almost all radio stations. Only one radio station, the BBC World Service, is completely independent. Cable subscribers have access to numerous foreign news channels. The print media is dominated by a company with close ties to the government. Daily newspapers are published in English, Chinese, Malay, and Tamil. Singapore relies primarily on its own defense forces, which are continuously being modernized. The defense budget accounts for approximately 30.5% of government operating expenditures (or 4.0% of GDP). A career military force of 55,000 is supplemented by 300,000 persons, either on active National Service, which is compulsory for able-bodied young men, or on Reserve. The Singapore Armed Forces engage in joint training with Association of Southeast Asian Nations (ASEAN) countries and with the United States, Australia, New Zealand, China, and India. Singapore also conducts military training in the United States, Australia, and on Taiwan. Singapore is a member of the Five-Power Defense Arrangement together with the United Kingdom, Australia, New Zealand, and Malaysia. The arrangement obligates members to consult in the event of external threat and provides for stationing Commonwealth forces in Singapore. Singapore has consistently supported a strong U.S. military presence in the Asia-Pacific region. In 1990, the United States and Singapore signed a memorandum of understanding (MOU) which allows United States access to Singapore facilities at Paya Lebar Airbase and the Sembawang wharves. Under the MOU, a U.S. Navy logistics unit was established in Singapore in 1992; U.S. fighter aircraft deploy periodically to Singapore for exercises, and a number of U.S. military vessels visit Singapore. The MOU was amended in 1999 to permit U.S. naval vessels to berth at the Changi Naval Base, which was completed in early 2001. In July 2005, the United States and Singapore signed a Strategic Framework Agreement to expand cooperation in defense and security. Singapore is nonaligned. It is a member of the United Nations and several of its specialized and related agencies, and also of the Non-Aligned Movement and the Commonwealth. The country has participated in UN peacekeeping/observer missions in Kuwait, Angola, Namibia, Cambodia, and Timor-Leste. Singapore supports two Provincial Reconstruction Teams and provides refueling aircraft in support of international efforts in Afghanistan. It strongly supports regional and international anti-piracy efforts, and has undertaken a leadership role in anti-piracy efforts in the Gulf of Aden. Singapore supports the concept of Southeast Asian regionalism and plays an active role in ASEAN, the ASEAN Regional Forum, and the Asia Pacific Economic Cooperation (APEC) forum. The United States has maintained formal diplomatic relations with Singapore since it became independent in 1965. Singapore's efforts to maintain economic growth and political stability and its support for regional cooperation harmonize with U.S. policy in the region and form a solid basis for amicable relations between the two countries. The United States and Singapore signed a bilateral free trade agreement on May 6, 2003; the agreement entered into force on January 1, 2004. The growth of U.S. investment in Singapore and the large number of Americans living there enhance opportunities for contact between Singapore and the United States. Many Singaporeans visit and study in the United States. Singapore is a Visa Waiver Program country. The U.S. Government sponsors visitors from Singapore each year under the International Visitor Program. The U.S. Government provides Fulbright awards to enable selected American professors to teach or conduct research at the National University of Singapore and the Institute of Southeast Asian Studies. It awards scholarships to outstanding Singaporean students for graduate studies at American universities and to American students to study in Singapore. The U.S. Government also sponsors occasional cultural presentations in Singapore. The East-West Center and private American organizations, such as the Asia and Ford Foundations, also sponsor exchanges involving Singaporeans. The U.S. Embassy in Singapore is located at 27 Napier Road, Singapore 258508 (tel. 65-6476-9100, fax 65-6476-9340). The Embassy's website is at (http://singapore.usembassy.gov/).